Cottages and self-catering properties available to rent direct from the owners, in Yorkshire and throughout the UK and Ireland. From Holidaycottages.cc. Yorkshire makes an excellent holiday destination with holiday cottages to be found in the Moors, the Dales, the coast and the city of York. Yorkshire is the UK's biggest county; so big that the Vikings, who used to run it, divided it up into East, North and West Ridings (or thirds). In 1974, after a thousand years or so the Ridings were abolished and after further recent changes no-one has a clue who runs what, so we'll treat the county as one. Yorkshire was a powerhouse of the industrial revolution, famous for woollen mills (centred on Bradford) and steel and cutlery (at Sheffield). Few of the great businesses remain, but the comparatively compact industrial part of Yorkshire is still not likely to attract hordes of holidaymakers, despite the inspired development of successful attractions like the Earth Centre at Doncaster. However, thanks to a surprising diversity of attractions in other parts of the region, holiday cottages in Yorkshire can be found in the Dales, on the Moors, on the coast and in the city of York. Best known are the Yorkshire Dales, so effectively publicised by the Bronte sisters. Their home at Haworth isn't actually in the Yorkshire Dales National Park, which starts a little further north near Skipton, nor is Ilkley and its famous moor. In fact, this area just south of the National Park is a hive of tourist activity: as well as Haworth, the towns of Hebden Bridge and Heptonstall are much visited. The Park itself is a wonderfully wild, open area of limestone hills divided up by the Dales which give it its name  Wensleydale (famous for its cheese), Wharfedale, Swaledale, Coverdale and several more. 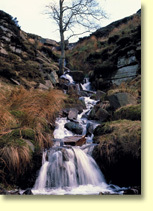 Yorkshire's other National Park is the North York Moors, which extends inland from the coast between Staithes and Scarborough. It's less crowded in summer than the Dales, despite fame as 'Heartbeat' country (the popular TV series filmed around Goathland). There are plenty of small villages around the edges of the park and along the coast where you will find a holiday cottage to rent  Staithes, Whitby and Robin Hood's Bay are great places to stay. The coast south from here features the major resorts of Scarborough and Bridlington, along with smaller Filey. In between the resorts is a terrific coastline which you can see by walking the Cleveland Way, which extends as far south as Filey (where it links up with the Wolds Way). From Flamborough Head, near Bridlington, you can see south along the coast as far as the Humber. There is another, gentler Yorkshire which runs between the highland areas, from Hull in the south, up to York and on to Richmond in the north. It's an area of rich farming land and attractive small villages, ideal for a cottage holiday. As well as being handy for both moors and coast, the area has its own attractions. Foremost is of course York, with its Minster, city walls and Jorvik Viking Museum, though it all gets pretty busy at peak times. Quieter and with an almost equally impressive church is Beverley, in the south. And if you feel like a bracing seaside walk, why not stroll the two and a half miles from Kilnsea to Spurn Head, along that narrow ribbon of sand that dangles at the mouth of the Humber? It's a National Nature Reserve and there is also lots of maritime activity to keep you interested  if you're lucky, you can watch one of the big ferries to Germany and Holland glide past. Taking a holiday cottage in Yorkshire will pay rich rewards in a region that, like it's people, is rugged, full of character and very welcoming to the holiday visitor.